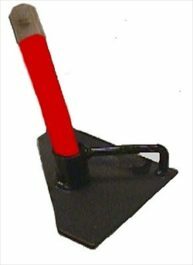 The flag holder is made from PVC tubing with a metal clip on the end that can be bent to accommodate different track size. The flag can be rolled up and stored inside the tube. The flag is reflective on one side and plain grey on the other. * Blue nylon flag 17″ X 17″ with “Safety First” printed in white on one side. 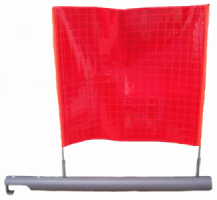 * This is a replacement flag for the one in the blue flag kit part number 0097-7.
allowing for better visibility. Fusee not included.